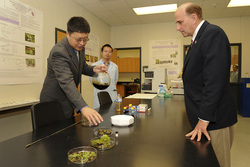 U.S. Rep. Louie Gohmert, right, watches a demonstration by Dr. Shiyou Li, left, director of the National Center for Pharmaceutical Crops in the Arthur Temple College of Forestry and Agriculture at Stephen F. Austin State University. The congressman visited Li's lab Wednesday to learn more about promising pharmaceutical crop research, including a recent discovery by SFA scientists of cancer-treating potential in giant salvinia, one of the most noxious invasive species in the world. Also pictured is NCPC research scientist Wei Yuan. NACOGDOCHES, Texas - U.S. Rep. Louie Gohmert visited Stephen F. Austin State University Wednesday to learn more about promising cancer-treatment research being conducted in the Arthur Temple College of Forestry and Agriculture's National Center for Pharmaceutical Crops. The congressman and representatives from his Tyler and Washington, D.C., offices visited the center directed by Dr. Shiyou Li and watched a demonstration on the medicinal properties of giant salvinia, one of the most noxious invasive species in the world. The contingent also met with Dr. Baker Pattillo, SFA president; Dr. Ric Berry, provost and vice president for academic affairs; and Dr. Steven Bullard, dean of the Temple College of Forestry and Agriculture. A team of NCPC researchers recently discovered that extracts of giant salvinia can effectively inhibit the growth of human tumor cells with minimum damage to normal cells. The researchers are also the first to have isolated a class of compounds responsible for the bioactivities. "Our research opens a new door to positive control of noxious invasive plants," Li said. "Also, our elucidation of the chemical composition of giant salvinia will help researchers better understand the molecular mechanism of invasion." Giant salvinia, also known as water fern and kariba weed and by its scientific name Salvinia molesta D. S. Mitchell, is a fern species native to Brazil. Since 1939, it has invaded lake and river systems in warm climates. Climate change, particularly increasing temperatures, a longer growing season and rising carbon dioxide levels, have increased both the abundance and diversity of invasive plants. Giant salvinia currently is one of the most widespread and environmentally, economically and socially destructive invasive plant species in the world.